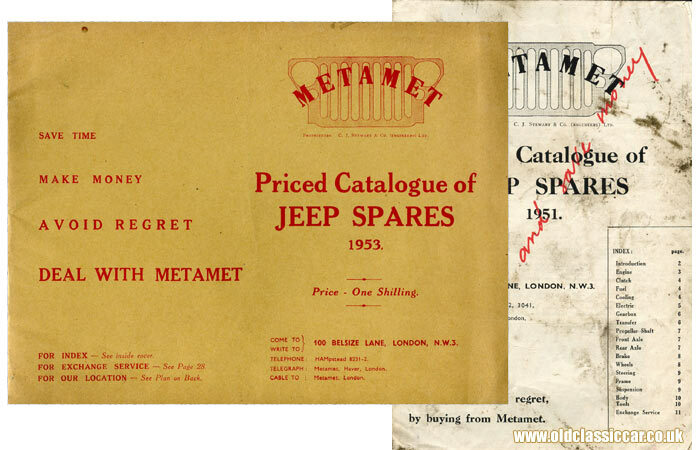 Metamet Jeep spares and conversions, in the 1950s. Homepage. This page: Two 1950s catalogues describe the company's services to Willys and Ford GPW owners. Following WW2 there were plenty of ex-military Jeeps in circulation, having been sold off in large numbers at disposal sales across the country. Metamet, the proprietors of which were C.J. Stewart & Co. (Engineers) Ltd, was established following the war to supply not only large amounts of parts, to suit both Ford and Willys variants, but also a range of conversions based on the basic Jeep design. Their address was 100 Belsize Lane, in London NW3. Featured here are two of their original catalogues, one for 1951 and another for 1953. The 1951 catalogue is a simple, almost A5-sized, publication, across the front of which someone has written "Keep this and save money". This could have been written by someone at Metamet, or perhaps was penned by the owners of Welland's Garage (more information), from which both parts catalogues originate. No price for the catalogue is given on the earlier copy, while buyers in 1953 had to shell out one shilling (five pence) for their, admittedly more comprehensive, copy. 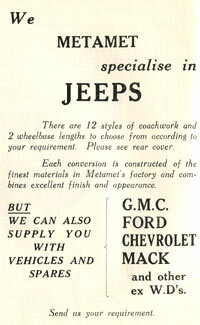 The 1951 issue simply lists the parts that Metamet could supply, with both Ford and Willys part numbers specified as appropriate. A 2194cc engine for instance, Willys reference A.1493, would relieve you of 70 GBP 0s 0d, but if all you needed was a new cylinder head (Willys A.1534, Ford GPW.6050) replacements were listed at 5 GBP 18s 6d. In all there are eight pages listing their spares inventory. To save money, motorists could take advantage of the company's exchange service, whereby popular items such as engines, carburettors, water pumps and brake parts could be purchased at a reduced overall cost, once the removed parts had been sent to Metamet and the remittance received. The rear cover lists basic servicing data for a Jeep's engine, with figures for wheel castor and camber, and brake shoe adjustment. There are also simple diagrams of the vehicle conversions that were available, of which more later. The 1953 copy is a much slicker publication, incorporating cutaway diagrams of the engine, clutch, carburettor, gearbox, transfer case and so on, rather than just a straight list of parts and prices. A complete engine now retailed at 77 GBP 10s 0d. 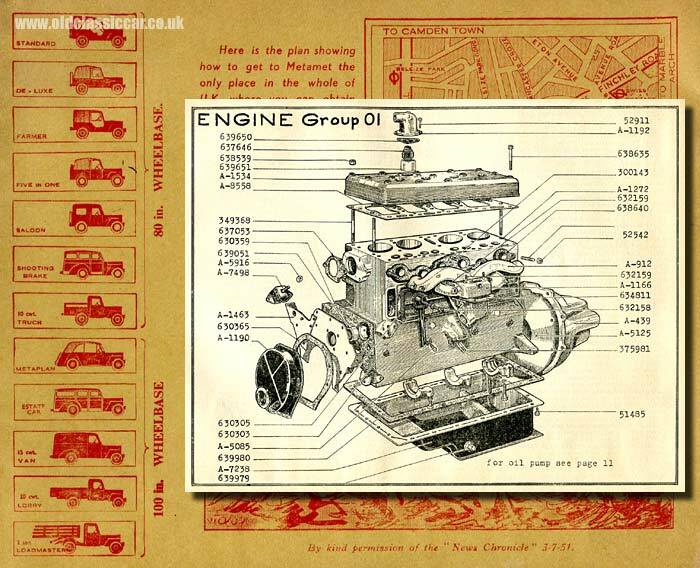 The rear cover once again illustrates the converted Jeeps that were available to order, a map of how to find their premises, and a cartoon. It would also seem that the company was diversifying at this time to cater for owners of other vehicles, such as GMC, Ford, Chevrolet and Mack. While the 1953 issue does not, the 1951 publication incorporates a couple of photographs showing examples of converted Jeeps, namely the "Five seater estate car" and the "Five-in-one". The former was based on the 100in wheelbase version, equipped with what is cryptically referred to as "special suspension". The bodywork was constructed out of seasoned ash, incorporating "... the use of many bent components thus eliminating joints ..."
The "Five-in-one" in their photograph was the first that they'd built back in 1947, and was the only Jeep conversion on the market at the time that featured full-sized doors in its design, compared to the door-less body tub of the standard Willys or Ford product. Note the folding hood, another of Metamet's designs, that "... enables you to convert the vehicle to an open tourer or to an enclosed drop-head coupe or to any intermediate, including a sunshine roof". Referring to it as a drop-head coupe implies a level of comfort and sophistication that I'm not quite sure was to be found in a converted ex-military Jeep, but comfort levels must have been an improvement on the Army original. A copy of the 1954 catalogue I've seen even refers to it, somewhat optimistically, as a "weatherproof sports cabriolet". This variant, it was suggested, was perfectly suited to the countryman, sportsman and caravanner, and indeed a photograph of a "Five-in-one" Jeep pulling a small caravan does feature in this later publication. The Land Rover introduced in 1948 would target a similar market. At a time when the supply of new cars and vans to domestic buyers was extremely limited, it's easy to see how converted Jeeps could appeal to motorists who were keen to upgrade their car, perhaps a pre-war example on its last legs. This variant was designed to appeal to motorists who wished to combine saloon-car comfort, with the versatility offered by the Jeep's 4x4 arrangement, a fore-runner of today's SUVs in many ways. It could be supplied with either a fixed or detachable all-metal body, with full-height, rear-hinged doors. The De-luxe on the other hand was based on a standard Jeep, to which the Metamet folding hood (as found on the Five-in-one) was fitted, as was the company's own design of bench front seat. The Farmer was designed to appeal to the exact same buyer as were the original Land Rovers. A drop-down tailgate was fitted, as was a simple "canvas and hoops" removable roof structure, while the spare wheel was fitted above the lefthand rear wheel arch. The rear body could also be adapted to carry milk churns. Shooting brake and station wagon. We have no hesitation in claiming this vehicle to be the most versatile shooting brake on the market thanks to its four wheel drive. The body is constructed of thoroughly seasoned wood and in order to gain maximum strength, the number of joints are kept to a minimum by using carefully bent and shaped timbers. The unseen areas are treated with fungicide whilst the remainder is given three coats of weather resistant varnish on a special impregnated base. The fully opening drop-down back enables loading to be carried out easily, whilst two full size doors give access to the bench type seat. The shooting brake body provides room for five people, together with good luggage room at the back, available because the spare wheel is carried out of the way on an underslung carrier. Particularly suitable for sports, fishing, shooting etc. Of all the conversions for which Metamet are so well known, our Station Wagon model is the pride of the fleet. Carefully built upon the sturdy extended Jeep chassis giving a 100 inch wheelbase, this vehicle can easily claim to be the only passenger car giving sufficient room and comfort with four wheel drive on the market. Built with two or four doors, also drop down tailboard or doors at the rear according to requirements. A luxuriously appointed spacious interior makes this vehicle ideally suitable for long journeys, especially where the going occasionally gets rough. Six opening windows permit ample ventilation, both front and back bench type seats, also room for plenty of holiday luggage at the back. The rear seat can be made to fold flat thus providing a 6 feet platform for the carriage of bulky goods or even for sleeping. I've yet to find contemporary references to the vans or to the Metaplan. More contemporary items relating to old vehicles can be found in the Motoring Collectables section of oldclassiccar.co.uk. Other Jeep material on the site includes this story of owning a CJ-3A Willys Jeep in the Philippines, plus photos of Jeeps serving in the British Army around the Suez Canal Zone, in 1952 & 1953: link.